Garden Walls Make Beautiful Outdoor Rooms! 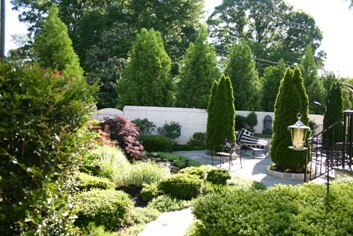 Garden Walls provide the utmost privacy! Their solid surface gives security from peeking eyes and wandering animals. They are structures of permanence, built to last for many years. Architecturally, they provide an opportunity to combine the look of the house with the garden by using the same building materials in both structures. This is such a nice detail and it’s the details that make an exceptional project! This white brick garden wall is the same brick as used in the house. It couldn’t compliment the house better. The enclosure has created an incredible courtyard living space for this family complete with pond and wall fountain. Garden Walls are a masonry product most commonly built of brick or stone. Concrete block walls are also seen, but do not provide as finished a look. A block wall can receive a stucco finish or be painted which adds to its appeal. I specify a 12-inch thick wall for any structure over 6 feet. At these heights, they look in better proportion (not like they’ll topple over) and are stronger. A proper reinforced concrete footing and structural steel in the wall is necessary. A wooden, English lattice topper on this wall allowed extra height to be added to an existing wall. Because of the construction of the wall, we couldn’t add more brick. The topper allows the owner to get the extra height for additional privacy. An urban oasis has been born! 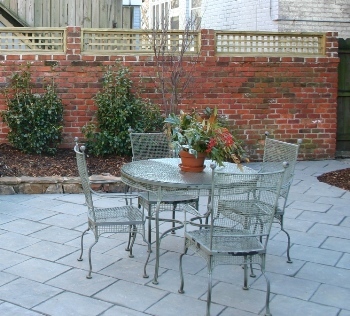 The height of the garden wall makes an impression on the overall design of the outdoor room. In some cases, a wall as tall as the building inspector allows is what is desired. Even at these heights, additional privacy may be needed. Notice in the top photograph how the planting of tall evergreen trees behind the white brick wall gives the utmost privacy. Shorter wall heights of 3 or 4 feet may be the most appropriate height for a small area. 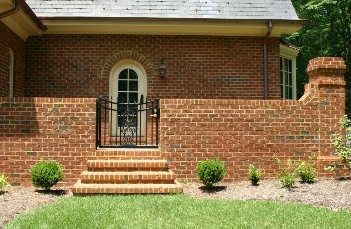 The wall adds a nice architectural detail and allows the addition of a decorative gate. Plants can provide additional privacy where needed. This garden wall enclosed a corner off the house making a seating garden off the master bedroom. The height of the wall is low, so the owners can look over the wall to enjoy the views of their property. The gate is black powder coated aluminum. I purposely centered the gate on the arched window. The wall gains height at the corner giving the wall interest and allowing a nice detail for the front of the house. This brick pillar eventually received a light fixture. The wall cap is the finishing course along the top of the wall. Often it is of another material other than the wall, but does complement and blend with the wall and house. There are many brick shapes that can give a brick wall a distinctive look. On all types of walls, overhanging the cap by about an inch is attractive. The cap can step out in ½ inch increments as well. The pillar at the end of the brick wall above has a cap that steps in increments to create an interesting finial to the brick pillar. Mortar (the concrete-like substance used between brick & stone) comes in a variety of colors. Ideally, they need to be a color that blends with the brick or stone. It looks especially nice for the mortar in the garden wall to match the mortar used in the house. This makes a smooth transition between the two structures. This stone wall steps down the hill and encloses a wonderful herb garden and seating area in front of an outdoor fireplace. Deer eating the landscape plants are a problem here. This wall not only creates a cozy outdoor room, but also keeps the deer away from their garden. 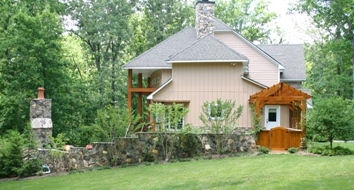 The house is stone and wood which is repeated in the garden wall and arbor. The view inside the walls shows a place that you can spend time in all seasons doing anything from dining to relaxing in the hot tub. 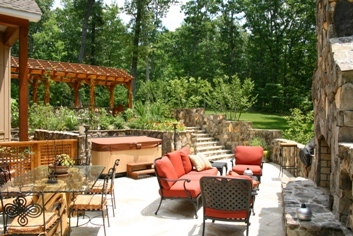 The structural elements of this outdoor room are designed by Dan Ensminger, a well-known Richmond, VA architect. Do you have a landscape design problem? I would like to help! Ask a question and you will get a quick response. You will get a page on the site dedicated to the topic, so friends and readers can be educated too. I hope to be hearing from you! Related Pages: Fences, Small Yards and Back Yards.